The SVERKER900 incorporates three current generators and four voltage generators, the amplitude, phase angle and frequency of which can be individually and accurately adjusted. In addition, the current and voltage generators can be connected in parallel or series to provide single-phase outputs of up to 105 A and 900 A. This means that, although the test set is principally designed for secondary testing of protection devices, in many applications it can also be used for primary testing. To complement the current and voltage generators, the SVERKER900 features a large colour touchscreen that provides an intuitive user interface and a powerful internal processor that eliminates the need to use an external computer for most types of manual and semi-automatic testing. The touchscreen provides access to a wide range of pre-configured virtual test instruments, allowing the required test function to be selected quickly and easily. The main virtual instrument provides timing tests as well as options for the manual determination of relay pick-up and drop-out points together with general facilities for generating, injecting and measuring currents and voltages. Other virtual instruments include a CT magnetisation instrument, a prefault-fault instrument, a ramping instrument and a sequence instrument. An impedance instrument is also provided, which allows relays to be tested directly from the impedance plane with conversion from impedance to voltages and currents carried out automatically by the SVERKER900 test set. Full manual control and configuration are also supported and, in addition to the touchscreen, the instrument is provided with a large rotary knob that can be configured as required to control the current and voltage generators. Test configurations and test results are stored in internal non-volatile memory and can be readily transferred to and from a PC via the instrument’s USB port. To further extend its versatility, the SVERKER900 also includes four programmable binary inputs, two programmable binary outputs, a timer with separate start and stop inputs, and measuring facilities for voltage, current, resistance, impedance, phase angle, power and power factor. 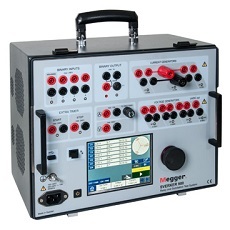 Applications for the SVERKER900 include commissioning and maintenance of distribution substations and generator installations; testing of electromechanical, static and numerical protection relays; plotting current transformer excitation curves; burden measurement for CTs; polarity/direction measurement; impedance measurement; single and three-phase injection testing in switchgear; checking SCADA annunciation and measurement values; and performing network measurements.